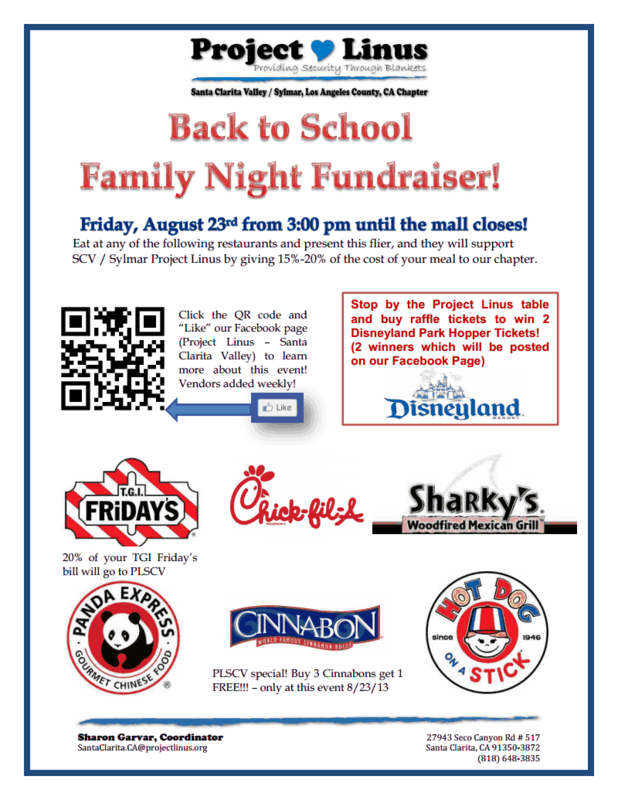 Back to School Night Fundraiser!! School’s in and we’re getting ready for a new year! Our Back to School Night Fundraiser is this Friday, August 23rd, from 3:00 to close at the Westfield Valencia Town Center Shopping Mall. We’re currently being supported by T.G.I. Fridays, Chick-Fil-A, Sharky’s, Panda Express, Cinnabon, and Hot Dog on a Stick. Simply print out our flyer and bring it to any of the vendors mentioned above, and we here at Project Linus will receive up to 20% of all proceeds. Some vendors are even offering exclusive discounts for our fundraiser, so be sure to read the flyer! Also, we are holding a raffle for four Disneyland Park Hopper tickets (there will be two winners), so like our faceBook page to stay updated on the winners as well as further updates! For more information, see our event wall. Let us know if you’re coming with a quick post on our wall! « Our First Donations and Yarn Drive!! This is a great inspiration and donation of quilts for those that want to give back.